China’s military recently launched three small satellites into orbit as part of Beijing’s covert anti-satellite warfare program, according to a U.S. official. The three satellites, launched July 20 by a Long March-4C launcher, were later detected conducting unusual maneuvers in space indicating the Chinese are preparing to conduct space warfare against satellites, said the official who is familiar with intelligence reports about the satellites. One of the satellites was equipped with an extension arm capable of attacking orbiting satellites that currently are vulnerable to both kinetic and electronic disruption. "This is a real concern for U.S. national defense," the official said. "The three are working in tandem and the one with the arm poses the most concern. This is part of a Chinese ‘Star Wars’ program." China’s 2007 test of an anti-satellite missile shocked U.S. military and intelligence leaders who realized the U.S. satellites, a key to conducting high-performance warfare, are vulnerable to attack. Officials have said China could cripple U.S. war-fighting efforts by knocking out a dozen satellites. Satellites are used for military command and control, precision weapons guidance, communications and intelligence-gathering. The official discussed some aspects of the Chinese anti-satellite (ASAT) program on condition of anonymity after some details were disclosed in online posts by space researchers. "The retractable arm can be used for a number of things – to gouge, knock off course, or grab passing satellites," the official said. The three satellites also could perform maintenance or repairs on orbiting satellites, the official said. Details of the small satellite activity were first reported last week in the blog "War is Boring." The posting stated that one of the satellites was monitored "moving all over the place" and appeared to make close-in passes with other orbiting satellites. "It was so strange, space analysts wondered whether China was testing a new kind of space weapon — one that could intercept other satellites and more or less claw them to death," the report said. The U.S. official said: "It is exactly what was reported: An ASAT test." According to space researchers who tracked the satellites movements, one of the satellites on Aug. 16 lowered its orbit by about 93 miles. It then changed course and rendezvoused with a different satellite. The two satellites reportedly passed within 100 meters of each other. One space researcher was quoted in the online report as saying one satellite was equipped with a "robot-manipulator arm developed by the Chinese Academy of Sciences." The Chinese appear to be testing their capability for intercepting and either damaging or destroying orbiting satellites by testing how close they can maneuver to a satellite, the U.S. official said. "They are learning the tactics, techniques and processes needed for anti-satellite operations," the official said. The Chinese have given a code name to the satellites and numbered the satellites differently. Chinese state-run media identified the satellites as the Chuang Xin-3 (Innovation-3); the Shi Yan-7 (Experiment-7); and Shi Jian-15 (Practice-15). The Shi Jian-15 is believed to be the satellite with the robotic arm. The official said the designation used in the blog, SY-7, was not correct. A Pentagon spokesman said the three Chinese spacecraft are being monitored by the U.S. Strategic Command’s Joint Functional Combatant Command for Space (JFCC-SPACE), "consistent with its routine operations to maintain track of objects in space." The spacecraft were tracked since the July 20 launch and the command "noticed the relative motions of these satellites amongst each other and with respect to other space objects," the spokesman said. The official said the Obama administration is keeping details of the Chinese anti-satellite warfare program secret as part of its policies designed to play down threats to U.S. national security. "There is a Star Wars threat to our satellites," the official. "But the official said the administration does not want the American people to know about it because it would require plusing up defense budgets." The use of satellites for space warfare appears to be a departure from past Chinese ASAT efforts. China faced international condemnation in 2007 for firing a missile that blasted a Chinese weather satellite in space, leaving tens of thousands of debris pieces. A recently translated Chinese defense paper on the use of a kinetic energy anti-satellite missile revealed that China is making progress with its anti-satellite warfare program. The report reveals that a U.S. software program called Satellite Tool Kit is being used by the Chinese military for its ASAT program. "Kinetic energy antisatellite warfare is a revolutionary new concept and a deterrent mode of operation," the 2012 translation of the report stated. "The construction of the corresponding information flow is certainly important to the effectiveness of the kinetic energy antisatellite operation. The STK package, being a powerful professional space simulation platform, will play an active supporting role in research on information flow in kinetic energy antisatellite warfare." A joint State Department and Pentagon report on export controls published last year stated that China is working on several types of anti-satellite warfare systems. "China continues to develop and refine its ASAT capabilities as one component of a multi-dimensional program to limit or prevent the use of space-based assets by potential adversaries during times of conflict," the report said. "In addition to the direct-ascent ASAT program, China is developing other technologies and concepts for kinetic and directed energy for ASAT missions." The report said China has said that to support its manned and lunar space program, it is "improving its ability to track and identify satellites—a prerequisite for effective, precise counter-space operations." "The People's Liberation Army (PLA) is acquiring a range of technologies to improve China's space and counter-space capabilities," the report said. A recent PLA analysis concluded that space is the "commanding point" for the modern information battlefield. "Battlefield monitor and control, information communications, navigation and position guidance all rely on satellites and other sensors," and Chinese military writings emphasize, "destroying, damaging, and interfering with the enemy's reconnaissance … and communications satellites." The military writings suggest that satellites could be part of an initial attack aimed at blinding the enemy. "Destroying or capturing satellites and other sensors … will deprive an opponent of initiative on the battlefield and [make it difficult] for them to bring their precision guided weapons into full play," the PLA report said. 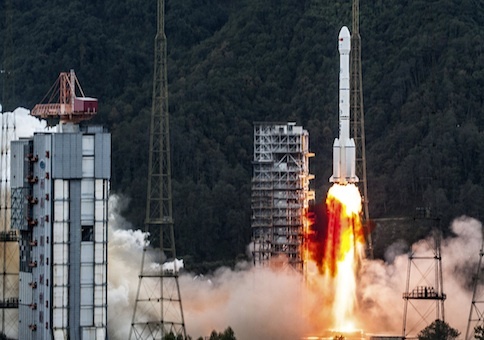 Rick Fisher, a Chinese military affairs specialist, said the maneuvering satellites are a significant element of China’s military space program. The satellite with the robotic arm is a clear dual-use, military-civilian satellite, said Fisher, with the International Assessment and Strategy Center. "The robot arm will develop a larger arm for China's future space station, but this satellite can also perform ‘co-orbital’ surveillance or attacks against target satellites," Fisher told the Free Beacon. "It is essentially China's version of the 2007 DARPA Orbital Express satellite that was criticized by liberals as step toward ‘militarizing’ space." According to Fisher, the satellites are part of a space surveillance and targeting system that will monitor space debris and also allow interception of space targets. Elements of the satellite system also will be used for China’s missile defense system, which is linked to China’s anti-satellite missiles. "But despite any potential ‘peaceful’ uses, the main point for the United States is that the PLA owns these programs and will use them as weapons against American space assets when it so chooses," Fisher said. "All future U.S. military satellites require low-cost stealth or defense capabilities if the U.S. is to keep its essential military space architecture." The space weapons program in China shows that no amount of American restraint will halt Beijing’s drive for military advantage in space. "Today China's dictatorship rejects all forms of strategic arms control that could deny the Communist Party a capability that it deems essential to the survival of its dictatorship," Fisher said. "When China gains superiority in any strategic category it will be even less willing to bargain away capability for the sake of ‘stability.’ China will not ‘reward’ any future U.S. nuclear weapon reductions or restraint in developing space weapons." China also conducted a maneuvering small satellite test in 2010, according to defense officials, which also was deemed an ASAT-related experiment. Two Chinese satellites rendezvoused several hundred miles above Earth in August 2010 as part of what was viewed by officials as a contribution to the anti-satellite weapons program. The Pentagon said at the time, "Our analysts determined there are two Chinese satellites in close proximity of each other. We do not know if they have made physical contact. The Chinese have not contacted us regarding these satellites." The two satellites also maneuvered during the Aug. 22, 2010 encounter. Based on the behavior, it appeared one of the satellites made contact with another satellite causing it to change orbits. The two satellites were estimated to have been as close as 200 meters to each other. This entry was posted in National Security and tagged China, Military, Missile Defense. Bookmark the permalink.